I love this gun and I havent even taken it out yet. It is a FN SPR A2. Bedded, threaded, 20moa Badger rail, Nitrex 4-20x50, and Burris XTR rings that are one size to tall. As soon as my Burris HDMR comes in, it will be replacing the Nitrex. The adjustable trigger is great. It is nice and light with no pre-travel. I was going to get a rifle basix trigger but now I really see no need to. You don't need a Basix trigger. That is a complete waste of money. Did you say you bedded the action? flyingirish04 wrote: You don't need a Basix trigger. That is a complete waste of money. Did you say you bedded the action? I agree. When I first got it, the trigger was heavy with no pre-travel. After I adjusted, it is damn light with no pre-travel. I also bump tested it in every way imaginable and nothing set it off so I am very happy. Yes the action is bedded. When I had it threaded, it was bedded at the same time. Very nice rifle! Post up your range results! 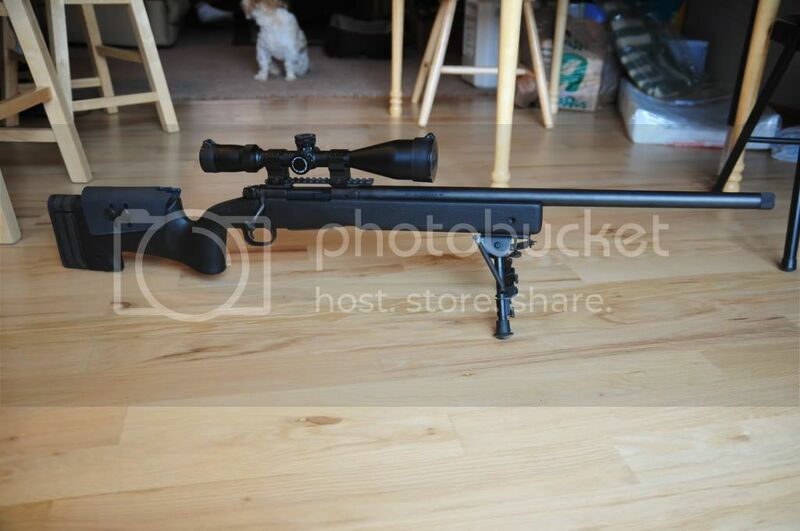 it now wears a swfa ss 5-20x50 and a muzzle brake. the brake works awesome enough to watch the impact. Keep us posted! I'm very interested in to see what you come up with for a load. One thing I have noticed is that the distance to the lands is really long. If I try to get anywhere close to them, I cant fit them into the magazine.